I love scallops, but until recently I had never made scallops. I repeat – never! Why? Scallops are expensive, they have to be cooked just right and it’s so easy to cook them just wrong. But we’ve got to learn sometime.. so, thank you sale at Harris Teeter, you finally gave me that little push to buy and cook scallops. The best cooking methods are brief, to avoid overcooking. these include: sauteing, grilling, broiling or poaching. overcooked scallops are tough and rubbery. Prior to cooking, you’ll want to pat the scallops dry. Large sea scallops (what I purchased) will take 3 to 5 minutes, while the smaller bay scallops will take only 1 to 2 minutes. But this is not a hard and fast rule – always remember it’s easy to overcook them! 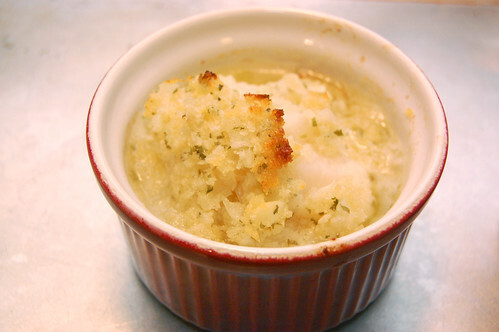 I adapted a recipe for Bay Scallop Gratin from the Barefoot Contessa. I took out some of the frills (like shallots, Pernod, and prosciutto) and tried to make it a little more accessible to busy folks like you and me! These scallops are cooked in butter – not Paula Deen style butter but yep, it’s still butter. I used two tablespoons of regular unsalted butter and one tablespoon of Smart Balance butter in an attempt to moderate just a little bit of the fat. The butter, white wine and lemon juice add a nice, delicate flavor that doesn’t overpower the scallops – but my favorite part is the panko sprinkled on top to give it just a little bit of crunch. My husband and I each got two large bay scallops with some couscous on the side, and we were satisfied and very happy at the end of dinner. Though I know it seems scary at first, seafood can be so easy (and FAST) to cook! It could really be your new best friend; why not start with scallops (the least “fishy”)? Preheat the oven to 425F. Place four ramekins on a cookie sheet. To make the topping – place room temperature butter in the bowl of a stand mixer with a paddle attachment or use a hand mixer. Beat in garlic, onion, parsley, lemon juice, salt and pepper on low until combined. Add in oil slowly; the mixture should resemble mayonnaise. Fold in panko with a rubber spatula and set aside. 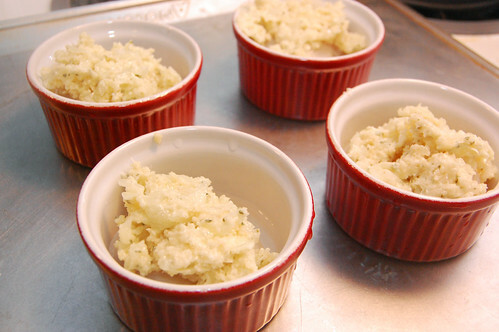 Evenly divide the white wine on the bottom of each ramekin. Cut the small muscle/membrane from the side of each scallop if present (here’s a handy how-to video – but my scallops didn’t have it). Pat the scallops dry with paper towels and distribute evenly in the ramekins. 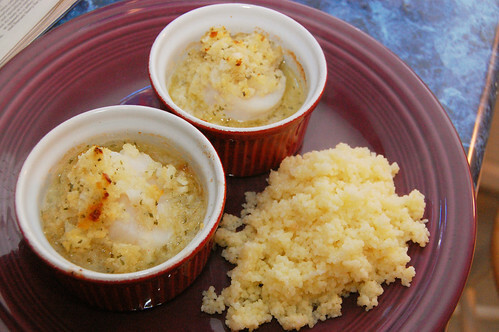 Spoons the garlic/butter mixture over the scallops and bake for 8-10 minutes, until the topping is golden and sizzling. The scallops should be barely done at this point, as they will continue to cook for a few moments outside the oven. Sprinkle with extra lemon juice and parsley for garnish. Serve in ramekins immediately. « Getting Ready for Farmers Markets!